The age of hands-free hot cocktails is at hand. Don’t put your slow cooker in the corner—it’s good for far more than quietly stewing tough cuts of meat. Load that big-batch juggernaut with booze for a winter party and revel in the shaker-less freedom of ready-to-serve Hot Buttered Rum and Mulled Wine. Guess what that means for your winter? More time to go a’wassailing—or whatever it is you do with your weekends. Bow down to the greats: Like all legendary, time-tested cocktails, the Hot Toddy keeps fuss to a minimum. The only modern invention that could simplify this stalwart further? A slow cooker. That game-changing device keeps the husky trio of Scotch, Demerara sugar and lemon slices at the ideal temperature, meaning all that’s left to do is bust out the nutmeg. Get the recipe. The key to this endlessly drinkable punch? A few wholesome glugs of brandy to balance out a bottle of Merlot. Add a harvest’s worth of fruit and spices—enter cranberries, orange peel, cloves and cinnamon—and let the wine simmer into crimson splendor. Get the recipe. Definitive proof that butter is criminally underestimated in cocktails, Hot Buttered Rum is an age-old cure-all—and way more satisfying than cold syrup. Perfect for when you can barely drag yourself out of bed, this version keeps it sick-day simple: Toss a bottle of dark rum into a slow cooker, followed by brown sugar, butter and spices. Then steep as you please. Get the recipe. Good luck finding more soothing company than rye whiskey, pumpkin, maple syrup and cinnamon. Can’t do it? That’s because the warm, spiced whiskey already has you under its spell—and there’s no turning away from a mug smothered in cinnamon whipped cream. Get the recipe. How do you wassail, exactly? The word stems from the early English phrasewaes haeil, meaning “to be whole,” and was used as a toast to one’s health. Wassail eventually came to refer to a hot drink of ale, whole apples and spices. This evolved version replaces the somewhat questionable warm ale with apple cider and Calvados. 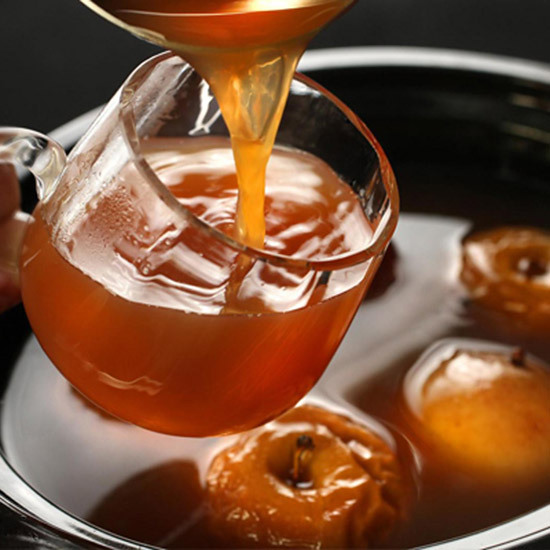 Tip your hat at the old recipe by floating clove-studded baked apples in the steaming brew of cider, cranberry juice and spices. Get the recipe.